Jump-start your future with Collegiate High School. Helping students reach their goals, CHS helps students earn an associate degree while simultaneously completing a high school diploma. Students save time and money on higher education, and COM waives 40 percent of tuition and fees for CHS students. 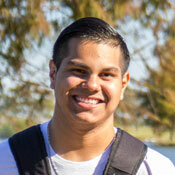 The CHS program is available to Clear Creek, Dickinson, Friendswood, Hitchcock, La Marque, Santa Fe and Texas City ISD students and home-schooled students. Enjoying the best of both worlds, Collegiate High School students attend all classes at COM while still participating in extracurricular activities at their current high school. Plus, CHS students have access to all COM student resources, events and activities. Students entering this program are considered college students. High school procedures will not be followed in the college classes, and college professors follow their own grading and attendance procedures. Professors do not send progress reports and other parental notifications home. Students must be mature and self-motivated to be successful.